History of the Christmas crèche: St. Francis invented the nativity scene. 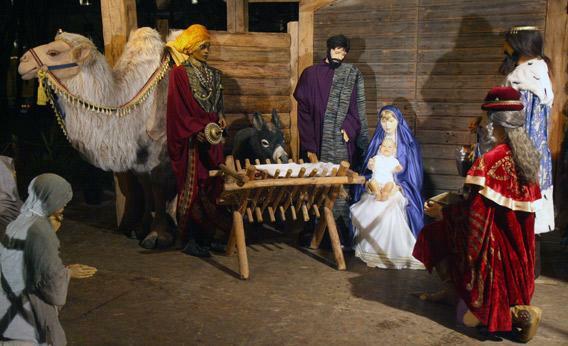 Who Staged the First Nativity Scene? Hint: The Year was 1223. Photo by Petras Malukas/AFP/Getty Images. Just as many families take treasured decorations—wreaths, ornaments, and nativity scenes—out of storage each holiday season, Slate reaches into its archives to share some of our favorite old pieces. Last year, L.V. Anderson explained the origins of the Christmas nativity scene. The original article is below. It’s nearly impossible to go through December without seeing at least one nativity scene, whether it’s a set of ceramic figurines in a private home, a life-size tableau in front of a church, or a cast of actors in a children’s pageant. And rarely does a year go by that these representations of Jesus, Joseph, Mary, the three wise men, some shepherds, and miscellaneous barn animals go unmolested by vandals or unchallenged by lawsuits. Why do people put up crèches at Christmastime, anyway? After the reformation, crèches became more associated with southern Europe (where Catholicism was still prevalent), while Christmas trees were the northern European decoration of choice (since Protestantism—and evergreens—thrived there). As nativity scenes spread, different regions began to take on different artistic features and characters. For example, the santon figurines manufactured in Provence in France are made of terra cotta and include a wide range of villagers. In the Catalonia region of Spain, a figure known as the caganer—a young boy in the act of defecating—shows up in most nativity scenes. In 20th- and 21st-century America, nativity figurines became associated with kitsch rather than piety, with nonreligious figures like snowmen and rubber ducks sometimes occupying the main roles. What about those nativity plays that children often perform at Christmastime? They are an obvious outgrowth of the miracle plays of the Middle Ages, but the reason children (rather than adults) perform in them isn’t clear. However, it’s possible the tradition stems from the Victorian Era, when Christmas was recast in America and England as a child-friendly, family-centered holiday, instead of the rowdy celebration it had been in years past. Explainer thanks Bruce Forbes of Morningside College, the author of Christmas: A Candid History.